The naturalistic philosophy of modern science has created a dilemma for evolution. Research on the origin of life seems to be unique in that the conclusion has already been authoritatively accepted … . What remains to be done is to find the scenarios which describe the detailed mechanisms and processes by which this happened. One must conclude that, contrary to the established and current wisdom, a scenario describing the genesis of life on earth by chance and natural causes which can be accepted on the basis of fact and not faith has not yet been written. The naturalistic philosophy of modern science has created a dilemma for evolution. No known laws of nature allow complex, living, information-containing systems to develop from the random interactions of matter. Yet, this is what is required in order for life to have evolved in the universe. 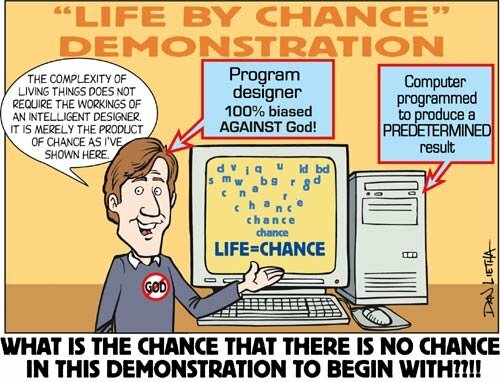 Creationists accept that life appeared on earth as a direct creative act of God. The design and information that we see in all living things is a result of an intelligence—not random occurrences. Many biologists try to separate the origin of life (sometimes called chemical evolution) and the universe from discussions of biology. These scientists recognize the challenge presented by chemical evolution, but their commitment to naturalism leaves them no other choice. 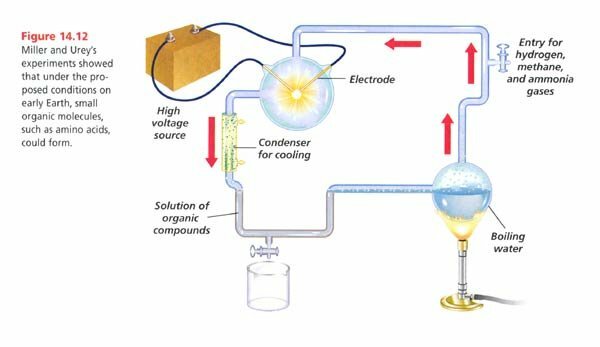 Many different models are used to explain how life can come from nonliving matter, but all of these models, including the famous Miller-Urey experiment, fail to account for the many chemical and biological barriers to spontaneously forming life. In the face of the challenges to chemical evolution, one of the codiscoverers of DNA has proposed that life was actually “seeded” by some alien intelligence. This does not solve the problem but only pushes the origin of life problem to another place. It also takes the issue out of the scope of science—such a hypothesis cannot be tested, it must be accepted on faith. 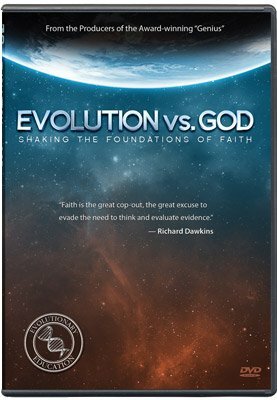 The failure of science to demonstrate how, where, when, or why life was naturally formed makes the acceptance of chemical evolution a matter of faith. Other attempts to explain how life formed are riddled with “maybe” and “possibly.” It requires more faith to believe that the universe and all of the living things on earth came from a big bang than it does to accept that the design we see must have had a Designer. God has revealed how life began on earth—He spoke it into existence. Research on how life first arose from inanimate matter is an example of historical science at its worst. There is absolutely no way to verify any hypothesis that attempts to explain how the very first living thing came about in a purely naturalistic way. Some evolutionary biologists try to separate the origin of life issue from evolutionary biology. The problem with this is that evolutionary scientists have a commitment to naturalism—all phenomena must be explained using only natural laws. Since the appearance of life on earth is a phenomenon that occurred, it must be explained. Naturalists must follow an evolutionary chain from the organisms living today back to the beginning of the universe. For them, complex animals came from simple animals which came from simpler organisms which came from chemicals which came from stardust. If one of these pieces is missing, evolutionary thinking loses its foundation. Naturalistic scientists often talk about evolution in more than the common biological sense—chemical/ organic evolution and the evolution of the universe from the big bang often appear in biology textbooks despite attempts to separate the issues. DNA contains information coded in the sequence of base pairs. The information can be compared to other forms of information like Morse code. There are no known natural laws that explain how information can arise from the random interactions of matter. The origin of information cannot be explained by evolution. Information: an encoded, symbolically represented message conveying expected action and intended purpose. One of the pioneering ideas in organic evolution was the “primordial soup.” According to this model, at some point in earth history, the molten earth cooled and oceans formed. 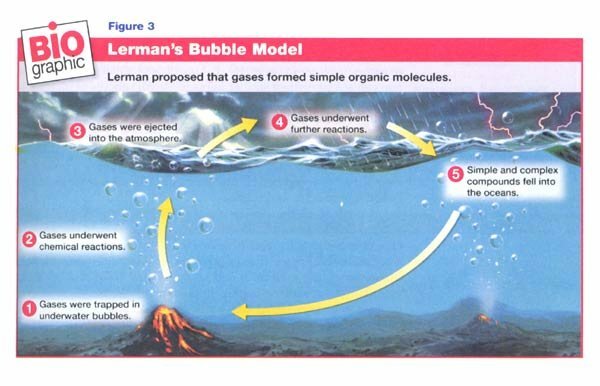 As rain fell, chemicals in a hypothetical pool, warmed by the volcanic activity and energized by lightning, organized into proteins, lipids, and carbohydrates. These molecules then organized into cellular structures like proteins, DNA, and cell membranes. The problem with this scenario is that chemistry prohibits it. Proteins do not form from piles of amino acids, and DNA contains a specific code that must be copied from another strand of DNA. Proteins cannot form in water because the water breaks the bonds that hold the amino acids together—a process called hydrolysis. Miller’s experiment demonstrates that intelligence can create some of the components of life. Most textbooks do not report the fact that Miller’s environmental conditions are not accepted any longer. Miller’s experiment produced a mixture that would have been toxic to life. The few biological chemicals that were formed had to be isolated from the watery environment, or none of them would have formed. One of the most famous experiments done in the primordial soup model was performed by Stanley Miller. Miller’s experiment is featured in virtually every textbook as proof that life could have come from matter. The major flaws in Miller’s experiment are rarely communicated to readers, and few scientists believe the scenario is accurate. Many other models have popped up in the decades since, but none have produced any more evidence than Miller’s failed explanation. The panspermia hypothesis suggests that aliens seeded life on earth by providing the DNA (promoted by DNA codiscoverer Francis Crick and depicted in the movie Mission to Mars), but this is a supernatural explanation and doesn’t solve the origin of life problem—where did the aliens come from? Recently, a hypothesis involving bubbles from deep ocean vents was put forward, but the same chemistry limitations apply. One of the most recent ideas is that viruses were the first forms of life, but viruses need cells to reproduce themselves. At present, there is no consensus among evolutionary scientists as to which of these scenarios produced life from simple chemicals. Nobody understands the origin of life. If they say they do, they are probably trying to fool you. Similar to panspermia is the idea that life ought to exist on other planets in our universe. Evolutionists reason that if there are hundreds of billions of stars in our universe, at least one of those must have a planet similar to earth that could support life. If life evolved on earth, it could have evolved on other planets. Within our solar system, Jupiter’s moon Europa and Mars are the focus of study. Billions of dollars are spent looking for life on other planets and listening for signals from extraterrestrials. The fact that bacteria have been found in extreme locations on earth drives evolutionists to believe they could have evolved and perhaps live in many places in the universe. Many ideas have been proposed to get around the chemical problems associated with the origin of life. One model suggests that bubbles allowed the compounds to become more concentrated, but there are still many physical and chemical barriers. Some scientists have recognized the impossibility of life forming on the earth and have suggested that life came from outer space— possibly from alien life forms. Another popular idea is that some intelligent designer created the universe and used the various types of evolution to accomplish his goals. This designer has intervened in history at various points and helped out his creation from time to time. The problem with this idea is that there is no way to tell when the designer intervened, and acceptance of this designer does not mean that the God of the Bible exists. Intelligent design, as a movement, does not recognize or promote any particular god, but accepts any. This idea may very well lead people away from the true God of the Bible by allowing them to choose whatever story they want to. The idea has been rejected by evolutionary scientists and the courts. The only true account of the origin of life on earth is found in the account of the only Eyewitness who was there. 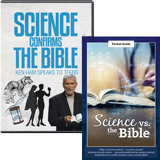 The Bible explains that the presence of life on earth is the result of supernatural actions of an omnipotent Intelligent Designer—the God of the Bible. Many complain that accepting this supernatural explanation stops anyone from pursuing knowledge about the natural world, but the presence of a logical Creator provides a reason to look for order in the universe. This point is underscored by the fact that many of the major fields of science were founded by men who believed in the Creator God of the Bible. The only aspect of science that the acceptance of creation excludes is the story of evolution. Darwin did not directly mention the idea of chemical evolution, but it is a natural extension of the logic of naturalism. Thomas Huxley, known as “Darwin’s bulldog,” boldly proclaimed the ability of life to come from nonlife. The idea of life coming from nonlife, spontaneous generation, was a popular idea from the time of the Greek philosophers. Louis Pasteur had performed experiments that showed spontaneous generation was not possible; so Huxley called the idea of the origin of life “abiogenesis” and said the evolution of protoplasm from nonliving matter had happened only in the early earth and could no longer be observed. This fact seems to disqualify it from scientific study. The Bible also explains that we should not expect to see life coming from nonliving matter since God ceased His creative activity after Day 6 of creation. So, evolutionists accept that spontaneous generation happened to get life started, but it can’t happen today—a clearly fallacious argument that is necessary to support evolution. Many of the theories on the origin of life may seem a little bizarre, but they come about when evolutionists realize the impossibility of chemical evolution producing life as we know it. One such evolutionist is Graham Cairns- Smith and his theory involving clay particles in the early earth. Cairns-Smith suggests that the many detailed experiments on the plausibility of chemical evolution have only gone to show the unlikelihood of its occurrence. It is highly unlikely that complex sugars and proteins (polysaccharides and polypeptides) could form, but even more unlikely that polynucleotides like DNA and RNA could spontaneously form. Cairns-Smith lists 19 difficulties that suggest the unlikelihood of the RNA world hypothesis and shows that the origin of life by a purely naturalistic accident is highly improbable. This chapter from War of the Worldviews examines the orgin of life. Some evolutionists, realizing the improbability of the spontaneous generation of life, suggest that life started somewhere else in the universe and arrived on earth somehow. The problem with this idea is that it cannot be tested and it just pushes the problem from earth to another planet. Experiments conducted by Stanley Miller in the early 1950s produced some of the basic building blocks of life, but what conclusions can be drawn from the experiments? Relying on an intelligently designed procedure and apparatus, Miller succeeded in producing a few of the 20 amino acids found in living things. One of the major problems for the origin of life is the presence of oxygen. Oxygen would tend to destroy the organic compounds needed for life, but if oxygen were absent, the atmosphere would lack an ozone layer to shield the compounds from ultraviolet rays—a Catch-22 for evolutionists. Miller excluded oxygen from his experiment, though today the evidence points to the presence of oxygen in the atmosphere throughout earth’s history. Starting in water is also a problem since water tends to break the bonds of some amino acids and prevents them from forming chains. Miller isolated the products in order to avoid this destructive reaction. What about information? Every living cell contains a code (A-T, C-G sequence) that originates from a sender (DNA) and is passed to a receiver (RNA) that translates the meaning of the code to produce a protein that is intended to be used by the cell for various functions. 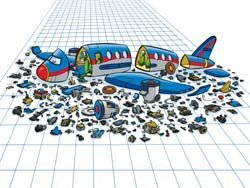 If any of the pieces are missing, there is no information, and the cell cannot function properly. Evolutionary hypotheses must be able to explain the origin of this information system and provide a mechanism to increase the amount of information over time. No known natural law can provide a mechanism to accomplish this task. DNA is an amazingly efficient storage device. A one-square-inch chip of DNA could store the information in over 7 billion Bibles—millions of times better than current technology. Biblical creationists have no trouble explaining the presence of such complex information—it was created by the most intelligent Being in the universe. Evolutionists often claim that, given enough time, evolution was certain to happen. Consider that Bradley and Thaxton calculated the formation of a 100-amino-acid protein assembling by random chance to be 4.9x10-191. It is generally accepted that any event with a probability beyond 1x10-50 is impossible, so we must conclude that evolution, requiring thousands of times this amount of complexity, is not likely to occur even if the entire universe were full of organic precursors. Naturalism and materialism can offer no realistic method for the origin of life on earth. One of the barriers to life forming spontaneously is the occurrence of right- and lefthanded molecules. 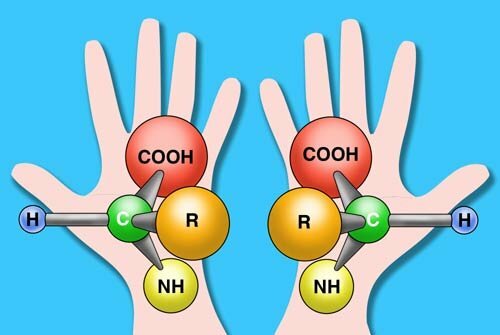 The proteins present in living things contain only left-handed amino acids. Random chemical reactions result in a mixture of both forms—a situation that is toxic to life. The earth seems to have all of the conditions that make life possible. The fact that life evolved so quickly after the earth supposedly cooled from its molten state leads some evolutionists to consider the idea that life originated on another planet. With the billions of stars in the universe, there has to be a planet with earth-like conditions, or so they say. Mars and Europa (a moon of Jupiter) were once thought to have the ability to support life, but the lack of evidence is causing this idea to lose popularity among evolutionists. The attempt to identify planets in distant star systems has produced some evidence, but no specific details or direct observations of planets outside our solar system. For rocks to travel from another planet to earth carrying life, or vice versa, the rocks would have to be ejected with the force of a meteor impact, travel for extended periods of time, and be subjected to cosmic radiation. These factors make it highly unlikely that a life form could make the trip. It is remotely possible that there may be life present on nearby planets if the life was “seeded” from earth. The SETI project, which listens for intelligent signals from outer space, and the recent Mars missions have failed to introduce any evidence. Astrobiology remains a science with no data to support it. Even if scientists could successfully form life in the laboratory, it would only prove that an intelligent being can create life from matter and energy that already exist. Evolution requires that life arises by itself from matter. 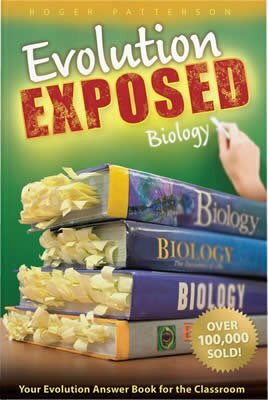 Claims that computer programs have demonstrated evolution are false. These programs only show that when you program a computer with a goal, it will eventually accomplish that goal. In 1860 a debate between Thomas Huxley and Bishop Samuel Wilberforce turned the tide in the public’s acceptance of evolution. Bishop Wilberforce had published a review of Darwin’s book of which Darwin commented, “It is uncommonly clever; it picks out with skill all the most conjectural parts, and brings forward well all the difficulties.” Bishop Wilberforce presented several scientific arguments, and Huxley suggested that, given enough time and material, six monkeys could type the 23rd Psalm simply by randomly punching the keys. It is reported that the bishop had no response, despite his training in mathematics. So what is the answer to Huxley’s argument of time and chance? When considering the probability of the assembly of a DNA molecule, the same problems arise. Harold J. Morowitz, professor of biophysics at Yale, has calculated that the formation of one E. coli bacteria in the universe at 10-100,000,000,000, or one in 10 to the power of 100 billion. Sir Fred Hoyle has offered the analogy of a tornado passing through a junkyard and assembling a Boeing 747, “nonsense of a high order” in his words. Natural selection cannot be the mechanism that caused life to form from matter as it can only work on a complete living organism. 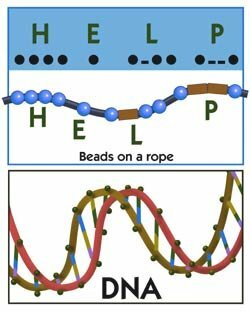 Despite many different calculations that demonstrate the virtual impossibility of the formation of even a single piece of DNA, there are those who accept evolution as a fact of nature. The idea of an eternal universe has been proposed to allow for enough time, but the second law of thermodynamics states that the universe would have reached “heat death” at some point in the infinite past. Alternate universes and dimensions have been suggested, but there is little evidence to support such claims. Another major problem with the probability argument is that the chemical processes that supposedly formed life are also reversible at every step. As water is released in the formation of amino acids, the water is then available to break the bond in the reverse reaction, which is actually more favorable. Oceans are the last place amino acids would form. Huxley’s typewriters would have to include a delete key for each other key in order for the analogy to be complete. No matter how much time and matter was available or the rate of interactions of atoms, the probability remains zero for the reversible reactions involved. The many distinct interactions within living systems clearly point to the presence of a designer, the God of the Bible. Since the first cells formed from compounds in the environment, how did the cells develop the information to make those compounds and then assemble them into complex structures? Where did the lipids (fats) come from in the earth’s early environment? How accurately can we know what the “primitive” earth’s atmosphere was like billions of years ago? Is the origin of life something that science can really help us understand? Are there too many unknown aspects to consider origins a valid scientific field of study? Since scientists accept that the environment used in the Miller experiment never existed, why is it still included in the textbooks as an explanation for how components of life may have formed? Since scientists reject spontaneous generation happening today, why do they accept that it happened in the past? Thomas Huxley argued that the 23rd Psalm could be typed by monkeys if given enough time. He considered this evidence for the possibility of evolution. Who supplied the monkeys with paper, typewriters, and a language system (how did matter originate if it created life)? We know from observational science that everything that comes into existence has a cause. What caused the big bang and the presence of matter in the universe? Why is the idea of panspermia (life coming from another planet) an acceptable scientific hypothesis if creation is not? Isn’t the hypothesis of panspermia just as “untestable” as creation? What evidence would be grounds for rejecting the origin of life from nonliving matter? If it is not falsifiable, then why is it considered scientific? If scientists could form life in the laboratory from nonliving matter, wouldn’t that only prove that intelligence is required to bring life into existence? Since no one has ever seen life form from nonliving matter, scientists must accept that it happened by faith. Isn’t this a religious position? The New Answers Book 1 by Ham, et al. War of the Worldviews by Ham, et al.